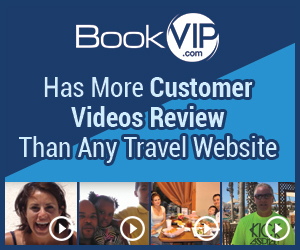 BookVIP is the largest provider of promotional vacation packages in the world which is why we have over 2.6 Million Facebook Likes and have more actual customer video reviews than any travel website including Expedia and have sent over 100,000 people on vacation already this year. I am still waiting for my Amazon Gift card for 100$, I have not heard from BOOKVIP since paying for my thip in Feb.2017. I would appreciate a call as I have dialed every number I could find on your pages or at least and e-mail, you have my address. I will reserve my complaint until I hear from you. em1susta@hotmail.com..There were a number of things I would like explained also, I have read most of your complaints and mine seems to be in line with misinformation and extra charges added on along with a mandatory visit to a resort for purchase that was not disclosed until after payment was made...please contact me for a visit . I didn't like: Did not supply gift card. Review #1049801 is a subjective opinion of User1049801.